Kent Alter serves as one of the ruling elders at KPC and has a passion for leading others in worship. He and his amazing wife, Donna, have been married for over 35 years and have three adult children, Bethany (& Daniel) Lewis, Katy Alter, and Addison (& Audrey) Alter. They have one grandson and another grandchild on the way and they are enjoying being “Pops” and “Ama”. 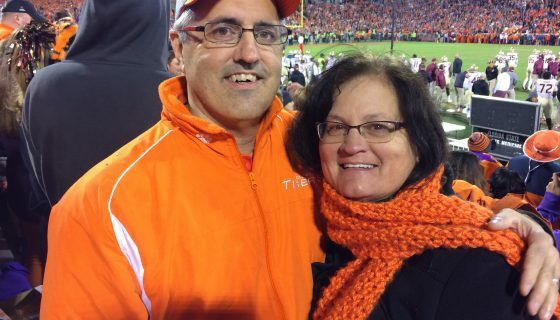 Kent graduated from Clemson University with an undergraduate degree in Mechanical Engineering and has spent his entire professional career at Duke Energy, where he has had the opportunity to serve in various engineering and managerial roles. He enjoys spending time with family and has various hobbies including playing the guitar, home remodeling, and watching sporting events. Now “empty nesters”, he and Donna are challenged and yet excited about this new stage in life and look forward to ways in which God will use them to proclaim God’s grace and the good news of Jesus to the local community and beyond.